In an era of scholarly (over) ­specialization, there exists a tendency to dissect the thinking of a particular figure of historical note into discreet parts according to our modern disciplinary typology. This tendency sets the framework for our study of the “great books” and writers in the scholarly canon. We allow our disciplines to impose questions on texts that they were not designed to answer. We “extract” theories from a larger theoretical corpus to use for our own purposes, unwittingly damaging those theories in the process of “extraction” from the supporting context. The historiography of Martin Luther’s writings serves as a case in point. Living in one of the most remarkable times in human history, Martin Luther wrote in the context of decisive political, scientific, artistic, cultural, and, of course, theological/ecclesiological change. Our modern scholarly tendencies prompt us to ask, “Is Luther a liberal?” or “What is Luther’s political theory?” and the process of “extraction” begins. As we carve out a “political thought” from Luther’s writings, we may cut off the rich theological framework that is essential to his political conclusions. On this note, Jarrett Carty, Assistant Professor in the Liberal Arts College of Concordia University, Montreal, nudges those who read and study Luther to let his texts comprise the starting point for theoretical development and scholarly inquiry. Luther is not a modern political thinker, envisioning a state “separated” from the tumults of the church. Luther does not discuss the nature of politics or government abstracted from humanity’s relationship with God. 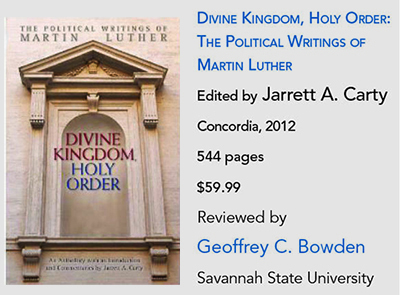 Carty’s Divine Kingdom, Holy Order: The Political Writings of Martin Luther provides a rich collection of Luther’s writings that engage politics from within Luther’s profoundly complex theological corpus. The conclusion for Carty: “[Luther’s] theological ideas were intimately connected to his politics and he saw them to have profound political implications” (4). Endeavors that seek to understand Luther’s political views without a theology, or that fail to conceive of the political ramifications of Luther’s theology, risk being both incomplete and misleading. To help us avoid this waywardness, Carty includes writings that one would not normally associate with political fare, including Luther’s commentaries on various passages of Scripture. In this collection of primary sources, the writings of Luther are divided into three sections: “The Reformation of Temporal Government,” “The Political Teachings of Scripture,” and “Luther’s Applied Political Thought.” Each of the writings has an introduction, offering background and interpretive guidance for the reader. Carty’s mastery of the historical context helps the reader discern the immediate objectives of Luther’s writing, as we weave each piece into a larger political vision. The standard Luther essays on politics are included, such as “Christian Liberty” and “Temporal Authority: To What Extent It Should Be Obeyed,” as well as some writings that are not usually associated with the “political writings”: “Commentary on Psalm 101,” “Commentary on Psalm 2,” and “Lectures on Zechariah.” This is an indispensable collection of Luther’s essays not only for those most concerned with political theory, but for those who take seriously the moral and social implications of theology. Luther’s position in the history of the Christian church and Western civilization generally demands that we read him correctly, and we can only do so if we have access to the relevant writings. Carty’s excellent and detailed collection expands our knowledge of Luther’s political thought beyond those narrow passages that mention politics and government specifically and should be imitated by those seeking to do the same for other Christian authors. Politics and theology cannot be artificially separated for these thinkers. Carty does his own interpretive heavy lifting with the inclusion of an “Introductory Essay.” As opposed to being distracted by the modern political questions often imposed on Luther’s writings, Carty keeps Luther’s political thought in its theological context. The main thesis of the essay bears this out: “Luther always emphatically praised secular government for its divinely ordained purpose to bring order to the temporal world” (9). Yes, it is possible to contend that Luther’s “political theory” is that government should provide order, perhaps even expand that into a theory of limited government akin to classical liberalism, and leave it at that. But this misses Luther’s larger point: government’s purpose exists within a much larger structure created by God. Government should seek its purpose, i.e. order, but should not pursue a purpose beyond that assigned to it in God’s design. Government has limited capabilities, rendering it ill-equipped to achieve spiritual ends. Carty explains the oft-misunderstood Lutheran typology of the two kingdoms: “The two governments were the manifestation of two divine gifts, though seemingly contradicting one another, but in fact complementing each other as two distinct ways in which God directed human beings on earth” (12). Luther’s two-kingdoms theory refers not to distinct physical realms with different governments, but rather to two different modes of moral thinking. In the Kingdom of God, the law of the Gospel is authoritative. In the Kingdom of the World, civil law and worldly rulers govern, though as instruments of God. Because both kingdoms are ultimately rooted in the authority of God, they cannot be fundamentally opposed to one another. God hands down the law of the Gospel through Christ, and orders temporal governments to maintain the larger human society. The obvious question is how does one know whether one is in the Godly or Worldly kingdom? When does the moral authority of the Gospel take precedence, and when does the rule of temporal authorities reign? Carty draws upon Luther’s distinction between the “inner” and “outer” natures of the human being to assist in answering this question: “No person was wholly Christian or righteous, and thus throughout life on earth, even life in faith, each person remained a sinful creature that must necessarily be restrained, controlled and brought to order through temporal government” (13). We see echoes of this all over Luther’s ­writings. In Christian Liberty, Luther actually takes the argument a step further and contends that good works, compelled by the laws of the Kingdom of the World, “reduce the body to subjection and purify it of its evil lusts, and our whole purpose is to be directed only toward the driving out of lusts” (81). The temporal realm assists in the purgation of evil from fleshly existence, “to make some progress in that which shall be perfected in the future life” (80). The two kingdoms track a different distinction, even more interesting for understanding the way in which the Christian is to behave in larger society, in Luther’s Temporal Authority: The Extent to Which It Should Be Obeyed. As opposed to distinguishing between two natures in one person, Luther argues that the two kingdoms reference two different types of people: the (“real”/“true”) Christian that does more than the law commands and the unrighteous/not-Christian that needs the law to constrain behavior. An interesting set of questions arises for Luther: can the use of the sword cohere with Jesus’ command to “turn the other cheek” and to “love your enemy”? Can a Christian follow the dictates of Christ and support or even participate in the violent activities of the government? Carty suggests in his introduction to Temporal Authority that these questions are best addressed within the framework of the “inner” and “outer” natures of the person: “The troubled conscience of the Christian prince could be put at ease: insofar as his use of force was for the public good of order and the just punishment of sin; like the hangman, he was doing his divinely ordained duty to curb sin, violence, and transgressions and therefore love his neighbor” (104). Carty’s “Introductory Essay,” unfortunately does not emphasize this crucial point, leaving it to be discussed in the introduction to Temporal Authority. Luther walks right up to the line of pacifism (understood as non-violently dealing with conflict), essentially admitting that Jesus teaches pacifism for believers, and then he bridges the gap between pacifism and the use of sword by arguing that many of the Christians’ neighbors “have not attained to such heights” (116) and the Christian has the responsibility to love one’s neighbor. So, there are two different modes of moral thinking, each of which applies to the Christian at different times, in different circumstances. Luther writes, “In what concerns you and yours, you govern yourself by the Gospel and suffer injustice toward yourself as a true Christian; in what concerns the person or property of others, you govern yourself according to love and tolerate no injustice toward your neighbor” (117). The command to “love your neighbor” shifts the moral focus away from the self toward others, and hence confers a different set of moral options (and even responsibilities) on the Christian. When dealing with yourself and your property, the Christian must be pacifist. When dealing with others and their property, the Christian can (and sometimes must) wield the sword. I believe Luther gets this wrong, but that is another essay. At least one thing is clear, however. Carty’s book, in both its excellent compilation of primary sources and his expert commentary, is essential not just for scholars of politics and/or theology, not just for Lutherans, but for all Christians and for all people who struggle with the relationship between the Christian faith and temporal existence. This is a book to have permanently on the shelf. Geoffrey C. Bowden teaches in the Department of Political Science and Public Affairs at Savannah State University, with specialties in ethics and politics and in political theology.